Anger and aggression are prevalent on UK roads with offensive gestures, full blown arguments and threats of physical violence commonplace. New research from car insurance specialist Admiral reveals 48% of motorists suffer from road rage, with 32% claiming they get it at least weekly. Furthermore, more than a fifth of drivers (21%) who suffer from road rage have had a full blown argument with another motorist because of it. Worryingly, 36% of motorists admitted road rage makes them more aggressive drivers, with 8% claiming they have even followed another driver as a result. Almost one in ten (9%) said they had been threatened with physical violence in a road-rage incident. James Carnduff, Admiral spokesman, said: “It’s bad enough letting yourself be annoyed by other road users, but following them or even worse, reverting to violence is ridiculous. “You have to ask yourself is it worth getting that upset at other road users? Admiral found being cut up by drivers (67%), drivers not indicating (65%) and the general rudeness of other drivers (61%) are the most frequent causes of road rage. Impatience also appears an evident issue, with motorists who drive too slowly (43%) more likely to cause road rage than those who drive too fast (30%). The survey also found that men are more likely to drive aggressively, have arguments, follow drivers and make offensive gestures. Kevin Clinton, Head of Road Safety at the Royal Society for the Prevention of Accidents (RoSPA), said: “Safe driving requires concentration, observation and anticipation as well as a responsible attitude to other road users. “This sort of driving increases the chances of the angry driver causing an accident, which in the worst cases, can mean people losing their lives. “In 2011, 122 people were killed, and almost 1,000 seriously injured, in accidents involving aggressive driving, according to the Department for Transport’s Reported Road Casualties Great Britain 2011 report. 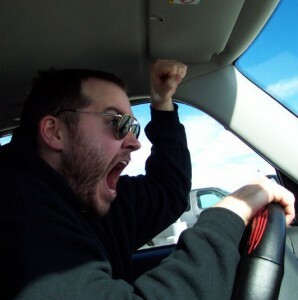 Dr Peter Marsh, a psychologist and behaviour expert, has explored what motorists can do to combat feelings of road rage. It’s a kind of personal territory that as humans, we are programmed to defend as it’s our ‘home turf’. The car provides us with opportunities for a sense of mastery and self-control, so when this is impacted upon by other drivers, frustration can arise as it’s one of the few opportunities to feel that we are in charge. The car provides a sense of protection from the outside world, so aggressive gestures can easily be conveyed to others before we make our escape inside our steel box. Open the car windows – this reduces the sense of invulnerability you might have. Regain a sense of mastery and control by ‘rising above it all’ because you have a better understanding of why your mood is changing adopt a Zen-like pose of smug serenity and superiority. YouGov questioned 3,120 drivers for the Admiral Survey of UK Motorists. Image courtesy of bikesandwich, with thanks.